You are here: Home / Incantation Comics / World of Incantation Comics. Sorcerers, witches, demons, and others do not quite live in coexistence, but use their powers to different ends. It may seem odd at first that a fantasy world could have both witches and sorcerers. Both terms are gender-neutral in this context, applying to any and all who fit the definition. The main difference between the two groups is simple: witches can only create magical objects to create effects, and sorcerers use direct elemental magic. This page is intended to explain the difference between witches' and sorcerers' powers, as well as related groups of the world, such as Demons and Legends. Witches are individuals who make contracts with magical demons. 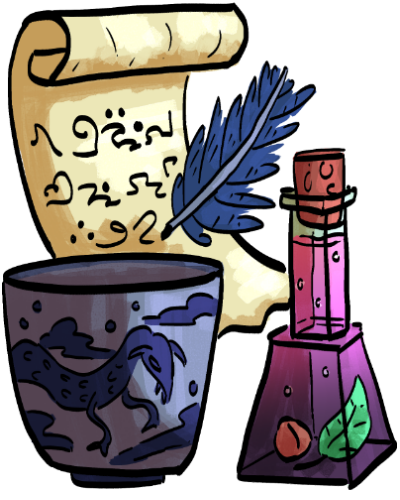 In exchange for the ability to craft potions, scripts, or objects with magic, witches deliver some of their creations on a routine basis to the demon. The demon requires these objects and consumes them in order to stay alive. Witches’ magic is all indirect. That is, witches create objects imbued with magic that cast the intended effect onto another person or thing. Witches do not cast spells onto their targets. Becoming a witch is not dependent on anything but finding a demon; however, some demons are more powerful than others and some people are better at witchery than others. Witches do have special ways to “give up” their magic, but all require heavy preparatory duties and run the risk of not satiating the demon enough. There are three major kinds of demons- water-dwelling demons, book-dwelling demons, and other demons. Demons cannot move too far beyond their source as of old, although their limits have changed over the years. Should one make a contract with a water-dwelling demon, one becomes a potion witch and can mix together potions. Book-dwelling demons have written witches, who practice magic calligraphy. The other demons produce object crafting witches, who make a variety of magical stuffs. There are four types of sorcerers: plant, air, earth, and water. Unlike witches, sorcerers use direct magic- casting spells onto a target for a certain effect. The different types of sorcerers stem from the location from which a sorcerer draws their magic, and eventually affect a sorcerer’s abilities. Sorcerers connect with a part of the landscape with the aid of an older sorcerer and make a bond that lasts forever in order to gain access to their magic. Often, potions from witches can aid in this process. 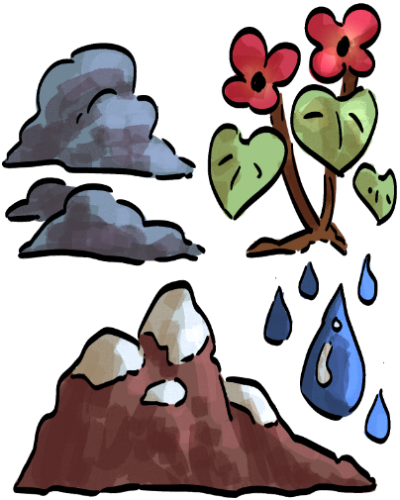 Plant sorcerers connect with large forests; air requires a strong wind; earth demands hills or a mountain; and water a large body of still or flowing water. Should the landscape change, the magic available to the sorcerer will ebb and flow to match the landscape- and should the landscape disappear, so shall its magic. There is no demon to please like for witches, however, there are other dangers to the source of magic. Sorcerers do not have any known way to give up their magic powers, but witches do sell potions meant to calm sorcerers’ magic for long periods of time. Early in the history of the world of Incantation, demons were rampant and occasionally destructive. Certain groups strove to eliminate demons or limit their power to keep humans safe- but these groups also greatly detested the demons. They named themselves the Legends, and the name stuck. In more modern times (like that of Pepper the Potion Witch or To Become a Witch) Legends are all but a vague and distant memory. The true threat to magic is the Four-Leaf Clover Society. 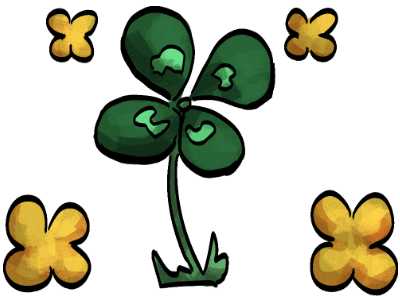 The presence of a single four-leaf clover can negate the effects of any witch's magic: thus the Four-Leaf Clover Society adopted their name. Over the years, they have expanded to target witches and sorcerers alike, using sheer force to prevent children from becoming either. They also use intimidation tactics and political bribery to create enclaves of non-magical peoples. They are mainly a fringe element to the larger society, but a very dangerous one to their direct targets. Many non-magical people do not support them, but no political entity has succeeded in completely removing the Four-Leaf influence.